One thing that has come out of Round 2 taking over the AMT, MPC and Polar Lights names is that a lot of kits that haven’t seen the inside of an injection moulding machine for decades are now being reissued. 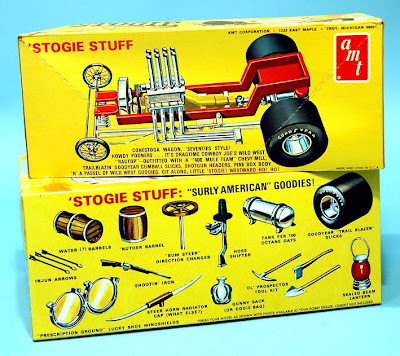 One AMT series that Round 2 has rediscovered is the way out ‘Show Rod’ car series, first released in the early 1970s. Show Rods - usually defined as custom cars built purely to do rounds of the car shows - can be mild or wild, and the wilder they are, the more visitors like them. 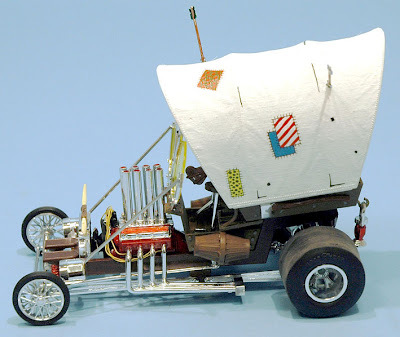 Admittedly many 1:1 scale show rods are really bizarre (many of Ed Roth’s creations, for example) but they are still drivable, even if in some cases ‘only just’! But many of AMT’s Show Rods went beyond this, as they have existed only as 1:25 scale kits, with no real-world equivalent. One thing they usually have in common is that each 1:25 scale rod revolves round a theme. 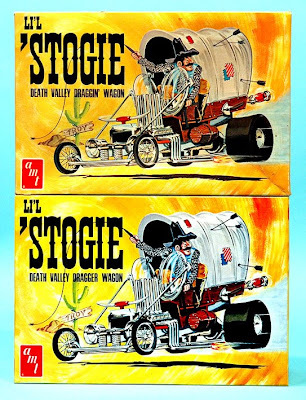 Two recent reissues that demonstrate this are the Li’l Stogie, a variation on a Wild West theme, and the Royal Rail, or what Henry VIII could have driven to get away from all those wives…! 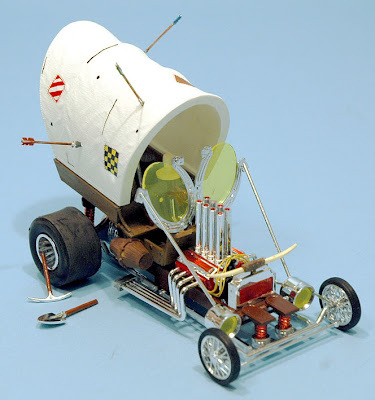 Li’l Stogie is a covered wagon with a V-8 engine, a pick and shovel, plus a gear shift that wears a Stetson hat! And yes, you also get the Injun arrows. 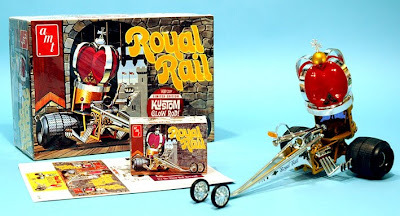 The Royal Rail is even wilder (some may say even ‘stranger’) and is perhaps best summed up by the box caption: “Our ‘crowning achievement’ in far-out showrods! Majestic ‘Henry V-8’ Mill propels rolling throne, ground-gripping ‘gumballs’ provide traction, way-out extended ‘chopper’ forks guide high-and-mighty king thing down the royal rod road…” The kit includes a mass of decals to personalise your own member of royalty, and a small reproduction of the kit box, which you can cut out from the flat card. 1 AMT 1:25 scale Royal Rail. The box has a sticker that indicates it is the special issue from the October 2009 iHobby Expo, Chicago. This version was moulded in luminous plastic, so if you don’t paint it, the rod will glow in the dark! Normal (if you can use the word for such a creation) issues will be in standard opaque plastic. 2 Both boxes for the AMT Li’l Stogie. The original 1970s issue is on top, present reissue supporting it. 3, 4 You get decal ‘patches’ for Li’l Stogie’s canvas top, and a set of arrows. 5 Opposite box sides show some of the ‘Stogie Stuff’.